I started a deal with Claudia of Coaching by Claudia. I design her Corporate identity and she will help me to take the next step for the magazine. I first had to promise to not make 4 editions this year, but 3. Starting this blog was one of those steps. Which is difficult because, I just start with things. Like with the cover, I get inspired and start creating and before you know it the Cover is done. Making it takes weeks, because I start and put it away and start again and so one. But I will do my best to keep you posted. An important one is, take the magazine and myself seriously. I think this magazine is amazing and I take it seriously. So why not act on it? Claudia says that if you act small you are small, even if this is not how you feel… So no more insecure text from me, you can hold me to it! Claudia also got me started on a form. To not put just a story on the website. But simplify it by asking the right questions. 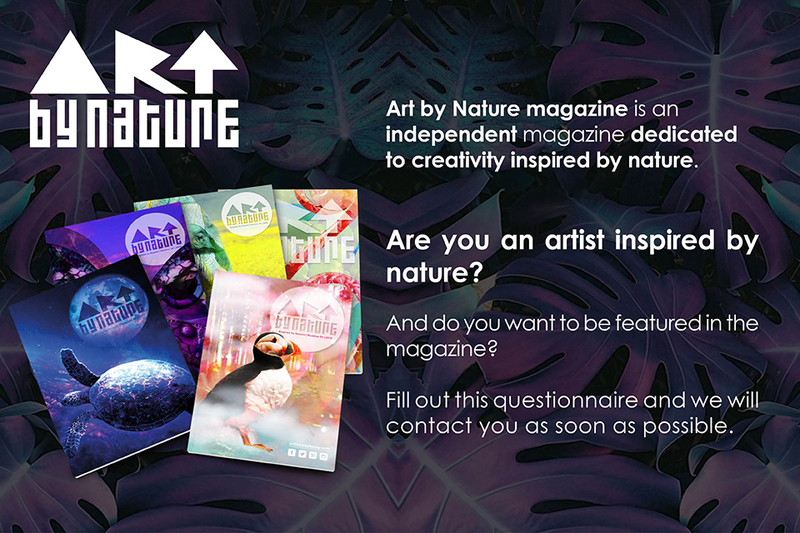 So are you are you a creative inspired by nature go to submit and fill out the form. I made one for advertising as well at. It’s a work i progress, but so far five artist have responded, which is crazy! And than there’s the big one, contacting businesses to getting the magazine published on paper and to spread the word to more people. Doing my best on Linkedin, already found one magazine owner who want to share her knowledge with me, so that’s a good start. Contacted Pineapple publishers to find out what it would take to get the magazine in stores and finally send an email to Sanoma publishers, because their magazine flow’s enthusiasm about making a magazine feels a like Art by Nature. I think the final one is making the website more professional and easy to use.